For years my husband and I kept our boat at an older marina on Chesapeake Bay. Shortly before moving west we had a neighbor temporarily take over the adjoining slip. He promptly strung a dock line across our shared pier about calf height, blocking safe access to our boat. I discovered it when I tripped, narrowly escaping injury. I moved his line — of course! The next time he saw me he promised he’d shoot me if I touched his line again. The marina owner appeared unconcerned. Fortunately, SoCal marina managers are savvier about safety hazards and liability issues. While everyone chafes occasionally about marina rules that might seem unnecessary, most are based on common sense or evolved from unfortunate incidents. In marinas we live at close quarters and share facilities, similar to apartment complexes, so it’s important to be sensitive to fellow mariners. Here are a few reminders, gathered from fellow boaters and San Diego dockmasters Kate Pearson of Shelter Island Marina and Ken Guyer of the Marriott Marquis. Noise: Most marinas set 10 p.m. for “quiet hours.” Whatever the hour, be respectful of dock mates’ ears and don’t blast music, whether you’re in the marina, waterskiing on the bay or running through a quiet anchorage. Everyone’s musical taste differs. Remember noise carries over water. When you’re talking on your cellphone on deck, lower your voice and maintain your privacy. Trip hazards: Coil your dock lines, electric cords and hoses and keep piers clear of debris and clutter to prevent falls and injuries. Store your extra gear on board or in dock boxes or marina lockers. 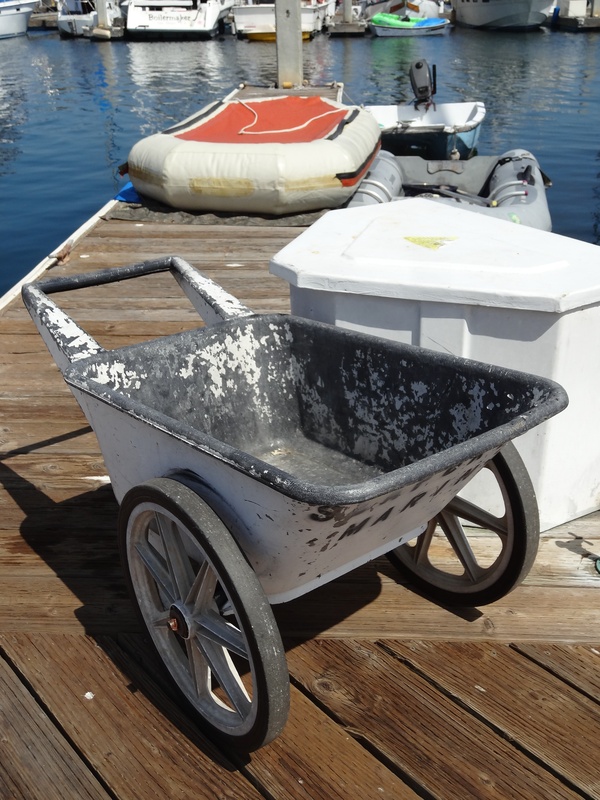 Dock carts: How often do you have to chase down a needed dock cart? Return them to their designated area when done and don’t leave them full of trash. Pets: We all love our pets. Yet, we need to be sensitive to others’ legitimate fears and allergies. Most marinas welcome family-friendly dog breeds, but always keep dogs on leashes and clean up poop. Restrooms, pools and other shared facilities: Be respectful of others and leave them as clean or cleaner than you found them, removing your towels, toiletries and discards. Drought: Always use a hose nozzle and conserve water. Trash: Use the designated receptacles and don’t leave it for others to remove. Please recycle. Maintenance projects: Whether you’re doing brightwork, engine or other work, be aware of impacts on your neighbors’ boats. If you have oily rags or maintenance debris, dispose of it properly in an environmentally correct manner. (If in doubt, ask the marina office.) If you spill something, like oil, on a dock or in the water clean it up promptly and notify the office and Coast Guard if appropriate. Fishing: Remember that many people own boats to fish. They need to start their engines early in the morning to reach their fishing grounds — don’t begrudge them their pleasure. And fishermen, don’t clean your fish and leave bloody guts on the docks. Parking: Marina parking is tight everywhere. Even if you have a large or valuable vehicle, don’t be a hog and take two spaces. Marina channels: Don’t clutter them with small boats. Fireboats need clear access to docks in an emergency. Speed: Watch your wake! Don’t speed through anchorages or mooring fields or swamp sailboats and small vessels. Dock Lines: Be friendly and offer to give neighbors a hand on arriving or departing. Security: Don’t hold gates open for strangers or unknown workmen. If in doubt, call marina security or the Harbor Police. Remember — friendliness and courtesy always enhance relationships. Have a tip to share? Email editor@thelog.com, with Dock Lines as the subject.